I need to run multiple async tasks in a console application, and wait for them all to complete before further processing. There's many articles out there, but I seem to get more confused the more I read. I've read and understand the basic principles of the Task library, but I'm clearly missing a link somewhere. I understand that it's possible to chain tasks so that they start after another completes (which is pretty much the scenario for all the articles I've read), but I want all my Tasks running at the same time, and I want to know once they're all completed. What's the simplest implementation for a scenario like this? The main difference between Task.WaitAll and Task.WhenAll is that the former will block (similar to using Wait on a single task) while the latter will not and can be awaited, yielding control back to the caller until all tasks finish. At least one of the Task instances was canceled -or- an exception was thrown during the execution of at least one of the Task instances. 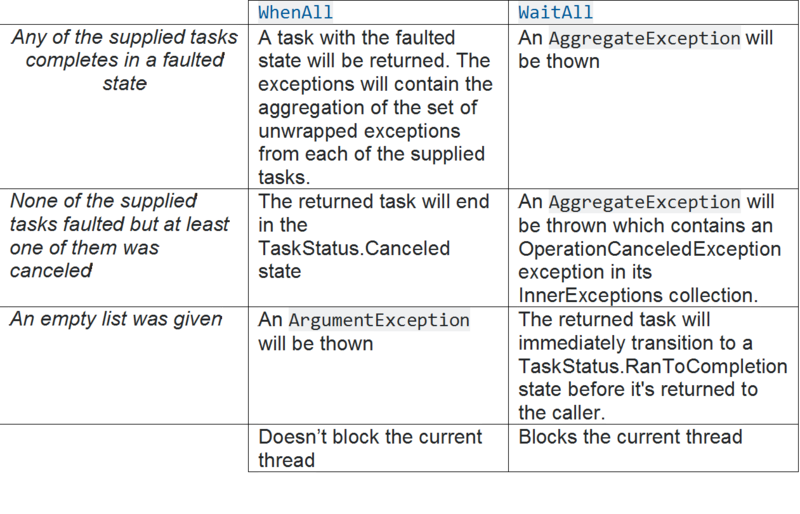 If a task was canceled, the AggregateException contains an OperationCanceledException in its InnerExceptions collection. If any of the supplied tasks completes in a faulted state, the returned task will also complete in a Faulted state, where its exceptions will contain the aggregation of the set of unwrapped exceptions from each of the supplied tasks. If none of the supplied tasks faulted but at least one of them was canceled, the returned task will end in the Canceled state. If none of the tasks faulted and none of the tasks were canceled, the resulting task will end in the RanToCompletion state. If the supplied array/enumerable contains no tasks, the returned task will immediately transition to a RanToCompletion state before it's returned to the caller. You can use WhenAll which will return an awaitable Task or WaitAll which has no return type and will block further code execution simular to Thread.Sleep until all tasks are completed, canceled or faulted. If you want to run the tasks in a praticular order you can get inspiration form this anwser. Do you want to chain the Tasks, or can they be invoked in a parallel manner? and don't forget to check the previous Task instance in each ContinueWith as it might be faulted. I prepared a piece of code to show you how to use the task for some of these scenarios. Will a C# console app wait for all task.runs to finish? How to force Paralled.Invoke to wait for all tasks to complete? How does C# Task.WaitAll() combine object states into one? How can I Wait for Arrays of Tasks of different Types?